Since Grandma didn’t write anything a hundred years ago today, I thought you might enjoy some jokes that were in the October, 1914 issue of Ladies Home Journal. “What is conscience”” asked the Sunday school teacher. There was a dead silence from the class. The new hand worked vigorously for a couple of days. Then he appeared before his employer with both eyes nearly closed, his mouth swollen, and red lumps all over his face and neck and hands. “What’s the matter?” said the farmer. “What is your business?” yelled the orator. Young Tommy returned from school in tears and nursing a black eye. “Betcher I’ll pay Billy Bobbs off for this in the morning,” he wailed to his mother. Posted on October 26, 2014 October 25, 2014 by SherylPosted in OtherTagged 1914, cartoon. Sadly, I did not get the doctor/ baker joke! I miss the entries from Helena, Hopefully she does a poem on Nov. 1? Humor and the points of reference that underlay the humor have definitely changed some of the last hundred years. I’m guessing the Grandma was pretty busy with something other than writing 100 years ago. You’ll keep us in suspense until her next entrees. I’m also thinking that she was busy with other things. One of the most challenging things about using a diary as the basis for a blog is the ebbs and flows in the writing of the diarist–but I guess it also teaches us patience, and in some ways even tells us something about the life of the diarist. I think that our 24/7 media/entertainment industries today also give us instant access to laughs and terror, such that we begin to believe that life is always exciting. One hundred years ago, people laughed because they interacted with each other, or felt feat at actual threats. But, most days went about doing the mundane tasks that kept them in house-and-home. One hundred years ago, people laughed because they interacted with each other, or felt feat at actual threats. But, most days went about doing the mundane tasks that kept them in house-and-home. Great jokes that might apply even today. It’s nice to hear that you enjoyed them. The Governor joke was probably more truth than a joke! I like the jokes. I am reminded that humor is pretty consistent through the ages. However, the temperance joke is rather out of sync with today’s culture. Public opinion in 1914 was already being affected by the prohibition movement that culminated in amending our constitution in 1920. It’s a good example of a single issue of politics that over-rides all others. It took the nation 13 years to un-do that mistake, but our political system is still subject to the single-issue problem. Now it’s abortion and immigration. The temperance issue was really becoming a dominant political issue in the 1910s. I’m sometimes surprised how many articles there were in magazines and newspapers from this era related to it. These make me think of the jokes we can still see in Reader’s Digest. Yes, it is a similar idea. I’m surprised how many jokes there were in the old Ladies Home Journals. Each month there was an entire page devoted to them. 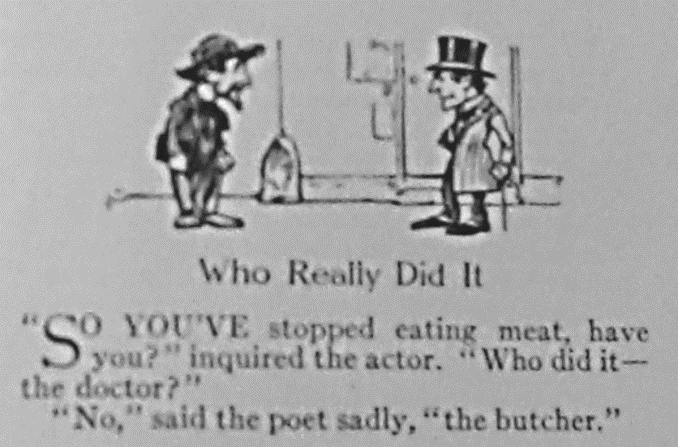 I just selected a few for this post, but there probably were 25 or 30 jokes in all in the October, 1914 issue. Poor Billy with his two black eyes! I have the same problem. I never can remember an entire joke when I want to tell it.